Precision Greens is often asked, “What makes you better than the other guys?”. It is a difficult question to answer, for many reasons, however; A good company certainly does not want to validate their strengths by exploiting the weaknesses of others. That method never feels good. So we are going to do our best to document all the areas that we feel we excel and let you review (if that’s okay with you?). Work Ethic – You will notice two distinct qualities with the Precision Greens Installation Team; one, we are almost always having a good time. We love our work because we are outside in a different “office” almost every week and we love it because we are good at our job. The second thing you will notice is that we work really hard. We are professionals on the shovel and on the wheelbarrow and smile in the face of a “bucket job”. We almost never sit for “break-time” and often plow through lunch break while premeditating an efficient afternoon strategy. Its like this because we love what we do. Experience – I can’t stress enough how valuable our experience is in relation to the work we do now. For Golf Greens we are literally learning something new on every project. Our shaping, contouring, layouts and cup positions are all constructed with past experiences in mind. 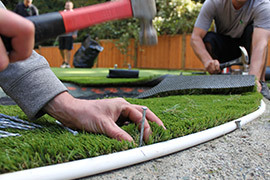 With Landscape Grass we are taking our techniques to every new job site and refining and perfecting the way we install a project. As humbly as I can write this, I feel we are the most qualified company in Canada for installations of every scale. Workmanship – This is where I want to climb a mountain and scream “we are the best”! lol. Every installer on our team has absolutely zero tolerance for imperfection. To be specific, you will never see a base construction that is compacted to less than 90% proctor (hard! 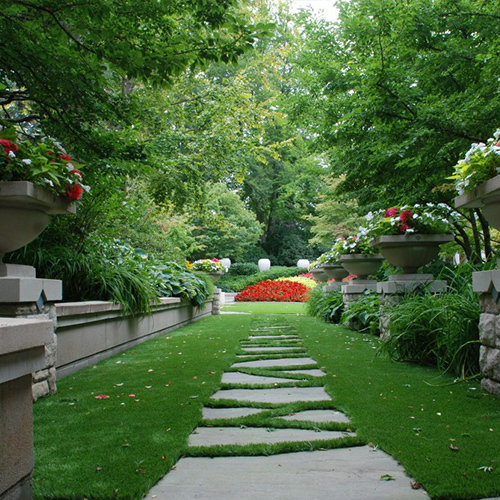 ), you’ll never see a landscape grass base finished with variances of more than 1/8″ over the span of 10′. You will never see a cut that is “out” more than 1/8″ (not noticeable) and you will never see a seam come apart. Precision Greens offers a two year warranty on our workmanship (if you see something wrong, we’ll come sort it out!). Product Quality – PG has worked hard with our manufacturers to develop the highest quality products available. You will get the softest, most responsive yarns in the world as well as an overall product that is manufactured to perfection. Precision Greens delivers the best or nothing at all! Pricing – Precision Greens will ALWAYS be competitive from a pricing standpoint. But be sure when comparing prices that you are comparing apples to apples. 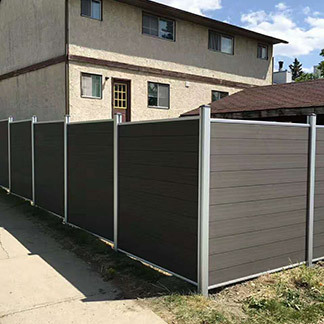 There are many corners that can be cut in the construction process that would potentially save your contractor thousands of dollars. Don’t just go by a companies quoted price, be sure to ask exactly how they plan to build your project. Even if you have chosen another contractor, please feel free to consult PG on how they are doing and what concerns you might have. It is better for our industry if we can help your contractor create a beautiful installation. 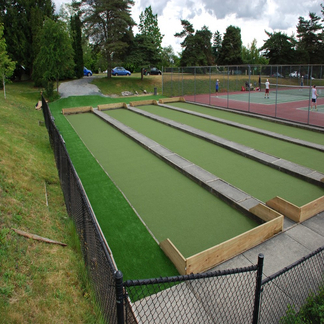 From the ground up – Precision Greens performs a full 4″-6″ excavation and replace it with an engineered permeable aggregate that is designed to drain fast in B.C.’s hardest rainfall while staying strong and unchanging for decades to come. The finishing layer will be “table top” smooth with no significant variances in height. 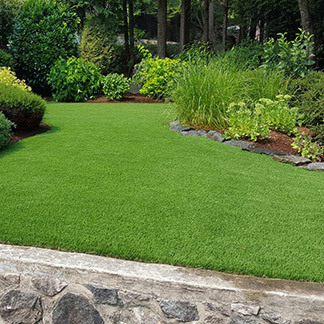 Precision Greens will rectify any drainage problems you might have and will be certain to only install on a base we know will last through decades of B.C’s wet winters. Pro Tip: if anyone says they use Sand to finish off your base or to build your base with, that usually means they have taken their notes from a US company/construction model and have no idea that your base is going to lose compaction in the freeze/thaw cycle of BC’s winter. This will have you leaving foot print indentations across your perfect lawn! Golf Greens – Precision Greens still prides itself on being Canada’s most qualified and experienced golf green builders. Any shape, size and concept is well within our capabilities to create. Currently PG works with professional Golf Course Architects, Landscape Architects, Designers and Custom Home Builders to create a lasting focal point that is aesthetically amazing and great fun for entertaining family and friends. It is our golf background and hundreds of golf green installations that make us the leader in this market. Aesthetics – Please take a look at our Gallery. Note: That ALL the pictures in our gallery are from installs we have performed here on the West Coast. Also note that in most of our competitors galleries that many of their pictures are from the desert. lol. This means they are using their franchises “head office” pics from installs they have done in the past. Also, take a close look at everything in the pic, from curves, to trying to spot a seam, to cup placements in golf to the finished landscape around the project. Notice the quality difference. 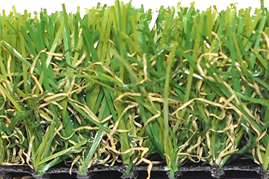 Choice – Currently Precision Greens has 5 different potential, aesthetically different, color combinations for golf greens and fringe options. All of which contrast perfectly. PG also has a diverse line of grasses whose characteristics complement grasses here in Western Canada. 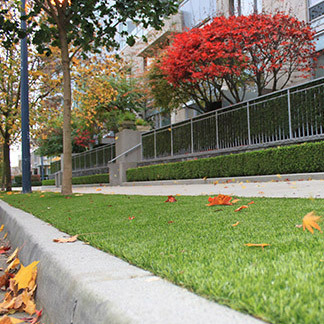 PG helped develop these grasses to suit our environment and it worked. In a couple of the products they are camouflage with the natural grass here in BC. Local and Independent – Precision Greens has been a local and independent company since 1999 despite several attempts from major franchise names to roll us into their big corporate operation. No thanks. Currently we have the freedom to work with several manufacturers in North America, Europe, Asia while controlling raw material choices from North Americas largest yarn developers. These factors contribute to bringing you the best possible product and not what a CEO says will work from his desk in another Country. Precision Greens is 100% Canadian Owned and Operated. We are proud of that fact there eh! 2000-02-15 05.08.06Reputation – To date we have built projects for Vancouver’s’ biggest builders, landscape architects and landscapers. The reason I mention this is that it acts as a signpost to understanding our quality. Big builders, designers and landscapers absolutely WILL NOT hire a company that makes their end product look bad, that’s just bad business. 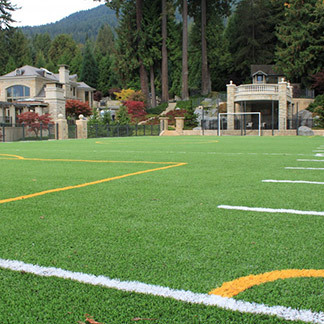 I am proud to say that Precision Greens is trusted by over 40 companies as their “go-to” guys for artificial grass and I am not too shy to say that we earned it. We were not put on these projects by default; these companies have done their research and are witness to our quality. 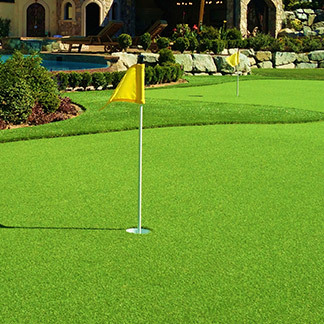 No Pressure Sales – Precision Greens has never tried to pressure anyone into buying our product, we have always simply presented the product to them with a design and a price and let our customers make up their own mind as to whether or not it is worth the purchase. Who are we to tell you what to do with your money? If you decide that a Synthetic Putting Green is something you would like to explore then please understand that we are grateful to those that would like to be educated on our services. 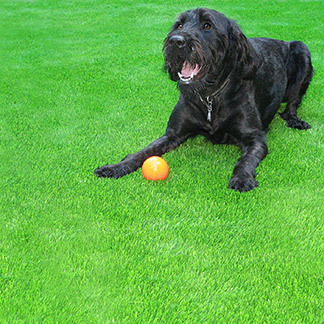 Precision Greens looks forward to the possibility of creating a project in your backyard!